The wood flooring in the family room was starting to buckle in some locations. The flooring installer asked that additional ventilation be added to the crawl space help prevent moisture buildup. 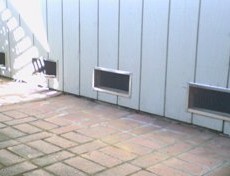 The homeowner decided to have four additional vents added to the crawl space where no vents existed.